2014 was a year of growing tension and instability in international affairs. The Middle East became witness to a bloody revolt by Sunnis against Shia dominated governments of Iraq and Syria. This revolt became crystalized in the rise of Islamic State in Iraq and Syria (ISIS). American diplomacy in the Middle East was widely criticized by a whole slew of actors that saw the developments on the ground from their strategic interests as the Islamic State conquered territory and massacred thousands of innocent Shiite and Sunni Muslims on its way to Mosul and the gates of Erbil. The U.S.-led coalition against Islamic State was unable to stop the radical group’s march and the coalition’s Arab members, along with Turkey, showed an unimpressive performance in their fight against the radical group. Presidential elections in Turkey took Recep Tayyip Erdogan to the presidential palace in Ankara. Erdogan vehemently defied Western demands in the fight against ISIS and continued to make the assertion that stability in Syria was possible only through Assad’s ouster. Russia responded to what it believed to be Western provocations against its national security interests in its near abroad and responded aggressively by annexing Crimea and sending troops to Ukraine. Moscow embarked on a campaign of destabilizing the pro-Western government of Petro Poroshenko and vowed that the Western sanctions against it will not be able to force it to change course. Iran continued to grab headlines as the negotiations over Iran’s nuclear program stalled again and the interim agreement was extended for a seven-month period. China solidified its westward economic push by investing billions of dollars in the energy and infrastructure of Russia and Central Asian states, while the euro zone continued its lackluster economic performance with nearly no prospect of recovery in sight. In West Africa, the outbreak of Ebola was another destabilizing development. The outbreak also demonstrated the World Health Organization’s unpreparedness and need for more resources as well as greater contribution by the international community against the spread of contagious diseases. Thanks to Saudi Arabia’s decision to use oil as a geopolitical weapon, the downward spiral in oil prices became another significant development of the year. Oil prices fell by as much as 60 percent from their highs of $110 in early June, compounding the economic crisis in Iran and Russia, which were already under wide-ranging Western sanctions. Against the backdrop of this volatile environment, choosing the best books of the year in international affairs becomes a matter of judgment and relevancy. As the title suggests, I intentionally avoided the use of “best,” as there are undoubtedly many other books that deserve a great deal of praise and attention. It’s fair to suggest that political order, conducting effective diplomacy, human health and prosperity, weakening of, and in some cases breakdown of, political institutions in different parts of the world, and the battle between forces of liberal democracy and religious extremism are the themes that dominated the year’s international developments. The following are ten of the most important books of 2014 that reflect major developments in international affairs. 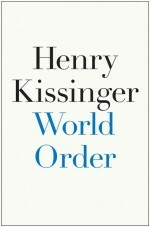 Written by the former National Security Advisor and Secretary of State, Henry Kissinger, World Order offers an in-depth historical perspective on the roots of order in international relations and an outlook on how present day disorder and divergent approaches to international relations by emerging players can be reconciled. Offering four concepts on order, Kissinger articulates on each concept by combining geography and history and the challenges they face. The four concepts focus on Europe, the Middle East, China, and the United States. Kissinger demonstrates how lack of consensus among key international actors has led, and will continue to lead, to increasing tensions in different parts of the world. The book aptly emphasizes on the role of culture and communication technology in world affairs and their impact on shaping socio-cultural trends. 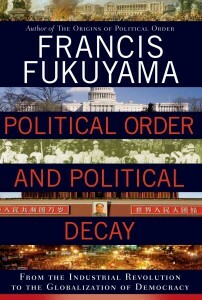 As a second installment to his 2011 and widely acclaimed book, The Origins of the Political Order, Fukuyama focuses on the development of institutions and their success and failure in different societies. One of the book’s key themes is government functionality in different parts of the world and factors that lead to the success and failure of political institutions. The book also offers a much-needed criticism of special interest groups in the United States and of their impact on formulating economic and social policies. While Fukuyama regards this dysfunction in the U.S government and the rise of the far-right politics in Europe as signs of democratic decay, he asserts that liberal democracy will be the universal destination of humanity. This is a seminal work on one of the emerging powers of our time: Turkey. 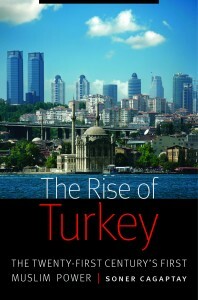 Written by Soner Cagaptay of the Washington Institute for Near East Policy, The Rise of Turkey is a unique account of how over the last decade and a half, Turkey has managed to become a significant player on the international stage and a key Muslim state in the Middle East that could overshadow the region’s traditional players like Iran and Saudi Arabia. Cagaptay delves into the political, cultural, and economic factors that have contributed to the rise of the country on the international stage and implications these factors hold for its future foreign policy direction. Cagaptay is considered one of America’s leading scholars on Turkish affairs, and he outlines the opportunities and challenges facing contemporary Turkey, arguing that “the country must find a balance between its Muslim identity and its Western affiliations.” The Rise of Turkey is undoubtedly an essential read for anyone interested in developing a serious understanding of modern Turkey. 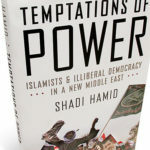 An important and fresh contribution to our understanding of political Islam, Temptations of Power offers an insider and intimate perspective on Islamic movements and the rationale behind their leadership and survival. Drawing from many interviews with Islamists in the Middle East, the book uncovers aspects of political Islam that can sound counterintuitive to general audiences. For example, it describes how political repression under autocratic military rules forced Muslim Brotherhood to adopt a moderate and inclusive polity, which was later transformed into illiberalism and failure in governance once the Brotherhood took power. The author, Dr. Shadi Hamid, is a fellow with the Project on U.S. Relations with the Islamic World in the Center for Middle East Policy at the Brookings Institution in Washington. This book by a former New York Times reporter in Tehran is an intimate account of the ongoing socio-political and cultural tug-of-war in today’s Iran between forces of liberal democracy and those of a closed, insecure theocracy. 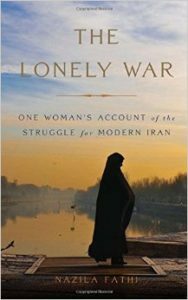 The Lonely War is an invaluable contribution to our understanding of current Iranian political and cultural dynamics, the driving forces behind Iranian foreign policy, and the challenges the country is likely to face in the near future. Another important contribution of this book is how it puts in context the powerful force of Iranian women in today’s Iran and the crucial role they are bound to play in the future of the country and its place on the international stage. This groundbreaking work on the surveillance state that we have come to know today came into being as a result of exchanges of email, private meetings, and interviews between the author and a former contractor at the NSA, Edward Snowden, who had just left the country and flown to Hong Kong, China. 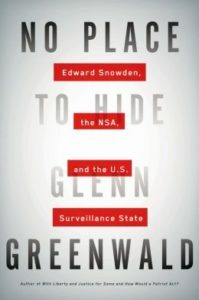 In No Place to Hide, Greenwald, co-founding editor of The Intercept and formerly a columnist at the Guardian and Salon, provides eye-opening and shocking revelations on the extent of surveillance in the U.S. on ordinary citizens as well as on foreign nationals and leaders. No Place to Hide is undoubtedly a must-read on the abuse of power and authority in the world’s greatest democracy and symbol of freedoms. Greenwald’s reporting on the NSA for The Guardian won him a Pulitzer Prize in April 2014. Outpost is an enlightening and entertaining read on the complex and tricky world of diplomacy by one of America’s most distinguished diplomats and a four-time ambassador under three U.S presidents. 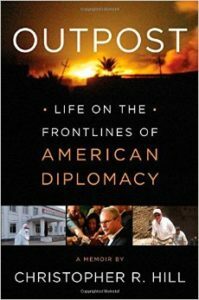 In Outpost, Ambassador Hill recounts his experiences in difficult diplomatic negotiations aimed at resolving the world’s major hotspots namely the Dayton Peace Accords, the crisis in Kosovo, North Korea’s nuclear program, and the national elections in Iraq. The book also offers a criticism of what the author regards as an excessively militarized foreign policy as a result of which “State Department became a kind of follow-on force to the military.” Outpost is an essential read for anyone with aspirations to enter the world of American diplomacy. 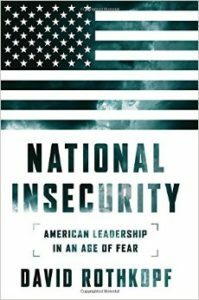 National Insecurity is a new and detailed account of how U.S. foreign policy and national security issues were shaped and discussed under Presidents George W. Bush and Barack Obama. It is a criticism of overreaction to Bush policies and of unrealistic expectations from the Obama presidency. Rothkopf, CEO and editor of the FP Group, which is the publisher of Foreign Policy, provides fresh perspectives into the failures of decision making in the annals of U.S. foreign policy establishment and the micromanagement of national security issues. In a sense, National Insecurity is a demonstration of a superpower in crisis; that is a crisis of transition into a new multipolar world with multiple centers of power and differing worldviews on how international affairs should be conducted. Flash Boys is a bold work of uncovering corruption. It shows how the U.S. stock markets are rigged by insiders and controlled by Wall Street banks. It’s the story of former Wall Street bankers who leave their lucrative and cushy jobs to deconstruct the world of high-frequency stock tradings, which are based on complex algorithms which rely on seconds-long or even milliseconds-long competitive knowledge of traders’ bids in the market before other traders, a practice known as “front-running”. 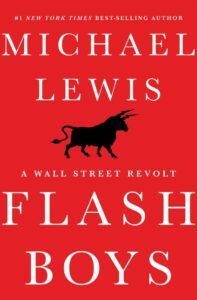 The significance of this book is that Mr. Lewis — author of such New York Times best sellers as The Big Short, Boomerang, and The New New Thing — has brought into light the institutionalized unfair treatment of financial markets that essentially function by using millions of peoples’ savings and their hard-won money. And as we all know from the 2007–08 financial crisis, corruption on Wall Street can have an impact on the ability of the United States to exert influence and leadership on the global stage. 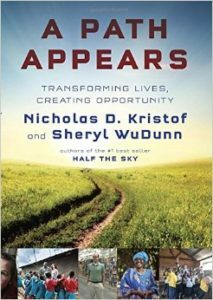 Written by New York Times columnist Nicholas Kristof and his wife Sheryl WuDunn, A Path Appears is a roadmap toward responsible humanity and a guide on how we all can be part of it, something that governments around the globe have miserably failed to address. The book is the result of meticulous research and proven advice on how many of our fellow human beings are contributing to ameliorating the lives of millions of people around the world, and how we too can do the same whether we have ordinary nine-to-five jobs, or make millions of dollars a year. Examples of such extraordinary human beings include a doctor who has developed a cure violence program to fight inner-city conflicts in the U.S, or ordinary Americans who have gone to Africa and transformed the lives of young girls by creating educational opportunities for them in places like Kenya. A Path Appears offers a much-needed sense of optimism and hope for our future in the midst of daily barrage of news media reports about violence, poverty and destruction.